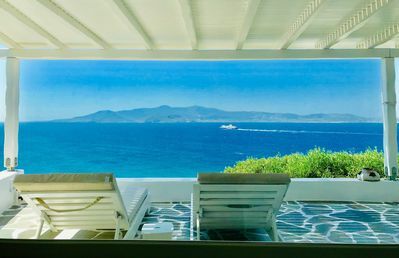 Elevate your trip to the island paradise of Aegina with a stay in this iconic sea-view villa with a private pool. 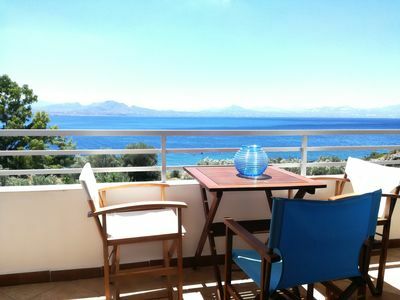 A short distance away from the cosmopolitan hub, Athens, the island of Aegina is a vibrant and picturesque locale. 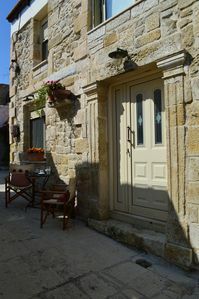 Doused in history and culture, historic ruins and ancient temples dot the countryside around it. Experience fresh and exquisite delicacies around the town or head down to the beaches that feature scores of attractions. 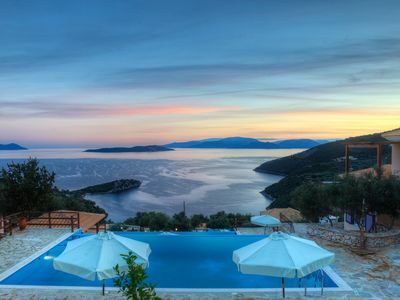 Perched some metres above the sea, Villa Zefi is a treat for the senses. Let the caressing sea breeze and the pleasant sunlight melt away all your stresses while you sip cool beverages by the poolside. Cook up a storm, and enjoy grilled delicacies in the outdoor dining area or cool off with a dip in the large outdoor pool. 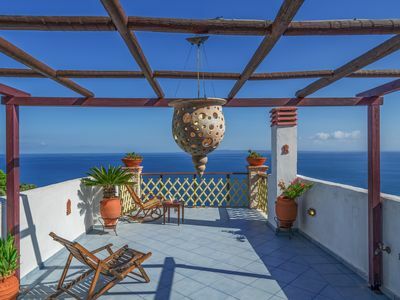 On a quiet evening, relax with a book in the veranda overlooking the sea or head out to the beaches that lie a few feets away from the villa, and surround yourself in natural beauty. 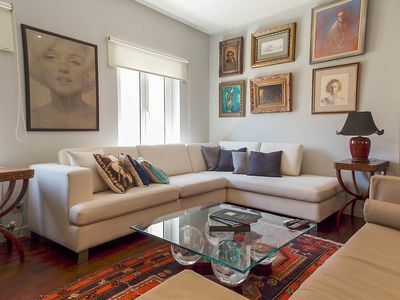 The interiors mix comfort and vintage charm for a winning combination. Eclectic art pieces add a zing to the soft palette of pastels and aubergine hues, and the light flooding through the glass panels elevate it further. 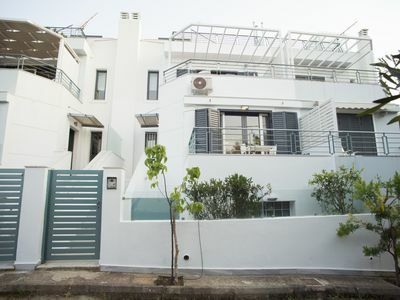 The refreshing views of the sea and the gardens in the lot, render the house with a zen and calm vibe. 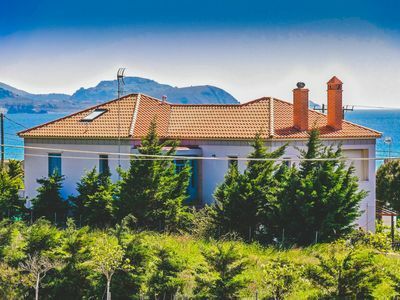 Villa Zefi consists of two apartments (one on the ground floor level and the other one on the 1st floor level) with separate entrances, which are also connected by an internal staircase. The ground-floor apartment house can host up to 5. It includes two large living areas (one of them features a fireplace) while it has access to a furnished veranda overlooking the sea. 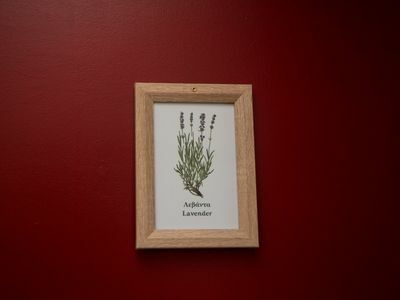 There is one fully functional open floor kitchen, an indoor dining area, two double bedrooms (twin joined beds with a mattress topper) plus a single bedroom (ideally - but not necessarily - for the accommodation of a child), and two full bathrooms. 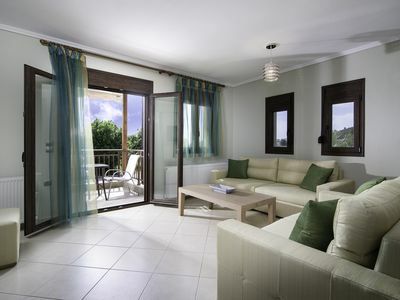 The double bedrooms open directly to the furnished veranda with a few-step access to the large swimming pool and the outdoor areas. The 1st-floor apartment can also host up to 5. 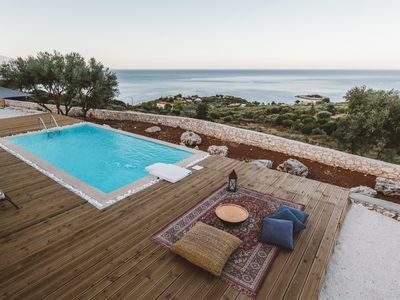 It also features two living areas; one showcases a fireplace while the other opens to a furnished veranda overlooking the pool and offering panoramic views to the sea and neighboring islands. 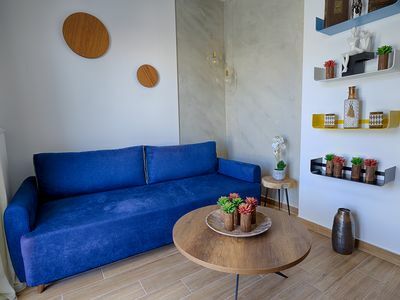 There is also, a fully equipped, modern open floor kitchen, an indoor dining area, two double bedrooms (twin joined beds with a mattress topper) plus a single bedroom (ideally - but not necessarily - for the accommodation of a child), and two full bathrooms. Upon request, 2 extra guests can be accommodated at extra folding beds. 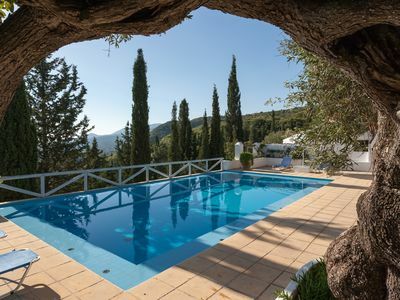 The outdoors of the villa include a large private swimming pool, an adjoining lounging area furnished with sunbeds and an outdoor dining area with a barbeque grill (and a wood oven) under an arbor. 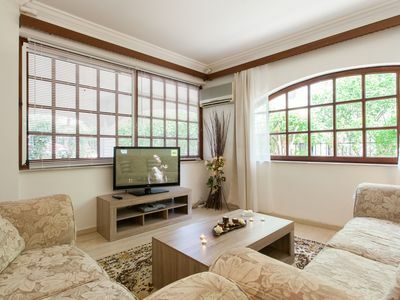 Villa's services and facilities include: Complete air conditioning (all bedrooms except the two single ones), TV, DVD player, WiFi internet access, washing machine, ironing equipment, dishwasher and a security alarm system. 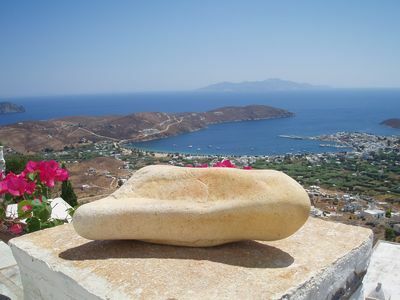 Other services included in the rental rates: Welcoming and guide from Aegina port upon arrival, cleaning service / fresh linens and towels twice a week (on Mondays and Thursdays), free bath amenities. 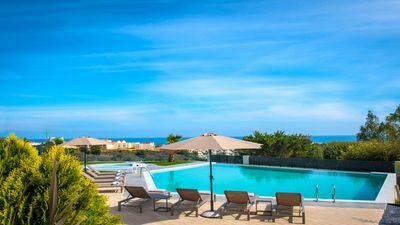 A twin villa located nearby Villa Zefi (it also belongs to the owner of Zefi, however, it is not in the rental market) includes its own outdoor areas and pool. At walking distance, guests can reach Marathonas beach and its amenities. 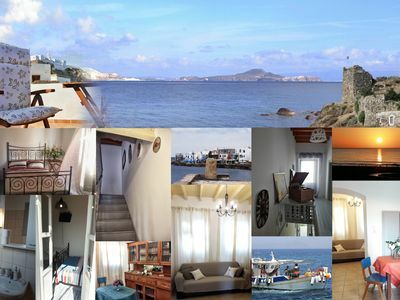 - Nearest beach (Marathonas) at 350 m.
- Nearest taverna and mini-market (at Marathonas beach) within 400 m.
- Aegina Town and Port (restaurants/tavernas, super-market, nighlife, shopping) at 4 km. Porto Rafti view by Akroploron for business or holidays. 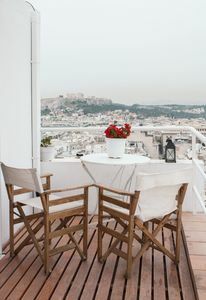 In the heart of Athens and only a few steps away from the city's attractions and historical sites. 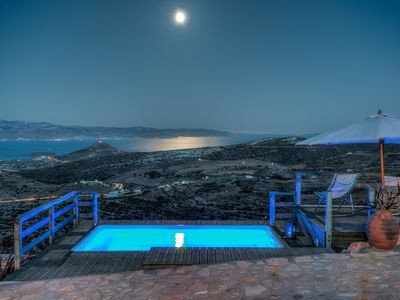 Vista Ariadne - Breathtaking 180° sea & sunset view and privacy.